The Google Compute Engine core concepts video provides a great overview of the technology. Please take a moment to watch it. As the video shows, Compute Engine is defined by Resources, and each of these Resources is available through the Compute Engine API. You can access this API through the Google API Explorer or by installing the gcloud sdk. There are few basic resources required to get up and running with any virtual machine running on Compute Engine. These are Images, Instances and Disks. An Image contains a boot loader, an operating system and a root file system that are necessary for starting up an instance. For all intents and purposes, you can think of the Image as the OS that you are running. The Disk acts as a filesystem. They operate as physical disks attached to your virtual machine but are more analogous to a network attached file system. As an example, we can separate a disk from a virtual machine and reattach it to another virtual machine. An Instance encapsulates the concept of a virtual machine. The virtual machine runs the OS and root filesystem defined by the image you choose at create time. The Key Resources show how a single virtual machine as viewed through the lens of the Compute Engine ecosystem. A single virtual machine is great, but modern web services usually require multiple machines working in concert to provide a scalable and fault tolerant system. Compute Engine offers the abstraction of Instance Groups to represent a group of virtual machines. Instance Groups allow you to collectively manage a set of virtual machines and attach services to that group of machines. A service is a simple label attached to the group that advertises this group of virtual machines as providing the same backend web service. Instance Groups operate over a set of virtual machines. To add a virtual machine to an Instance Group you first spin up your virtual machine and then call the Instance Group API to tell Compute Engine that this Instance is now part of an Instance Group. The Instance Group Manager automates how virtual machines are added to the Instance Group. There are a few caveats. 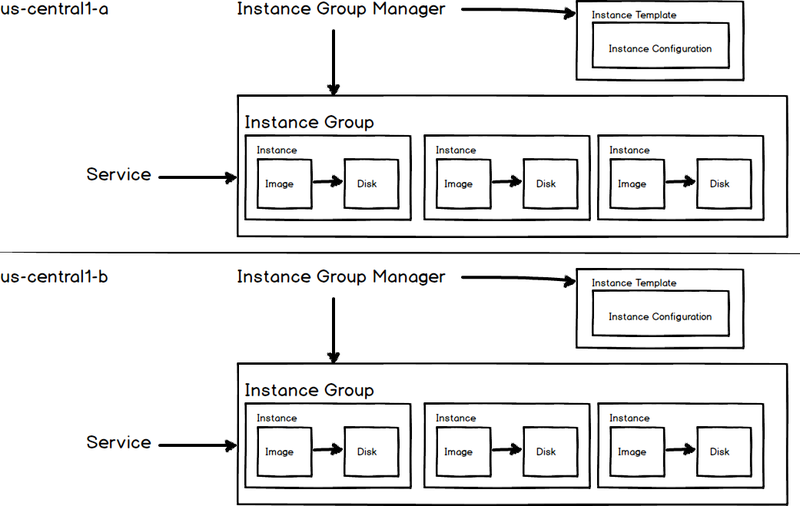 First, instances in a managed Instance Group must be homogenous. That means they must all be created using the same base image, disk and machine type. 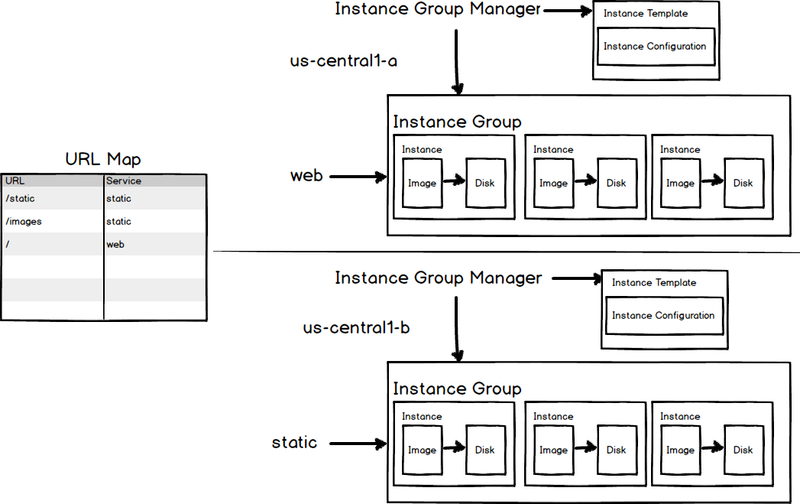 To facilitate this homogeneity the Instance Group Manager operates over an Instance abstraction called an Instance Template. 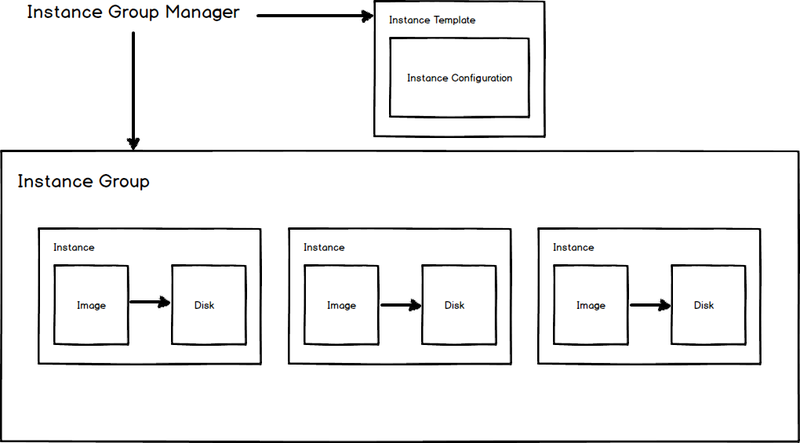 Instance templates are configuration files that define the settings of an Instance (and by extension of an Image and Disk). Instance templates can define some or all of the configuration options. For example, the OS, the RAM, or the hard drive size. Instance templates separate the configuration of your virtual machine from the creation and running of the virtual machine. When creating a new managed Instance Group you specify the Instance Template to use for the Group. You also tell the Instance Group Manager the size of your Instance Group. The Instance Group Manager will create that number of instances and assign them to your managed group. You can then resize your Group with one command and those Instances will be brought to life and join your Instance Group. If any Instances are destroyed or deleted the manager will bring them back to life for you. Compute Engine allows you to specify the region and zone where your virtual machine exists. This gives you control over where your data is stored and used. Regions are broad categories such as central US or eastern Asia. Zones are subdivisions within a region such as zone a or zone b. The way to reference a zone is as <region>-<zone>. For example <us-central1-a> has the region us-central1 and the zone a. To build a fault tolerant system ideally you want to have your Instances spread out over multiple zones. To distribute your system globally you can spread your instances across multiple regions. 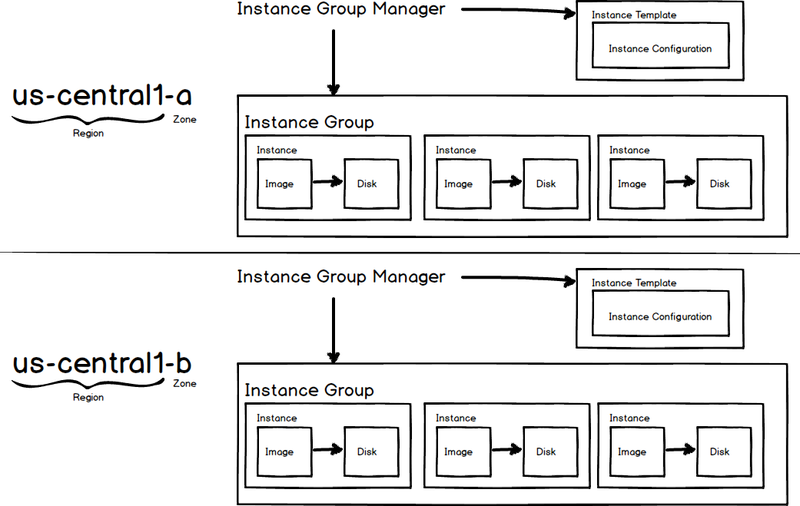 In the following example, we have two separate Managed Instance Groups in two different zones. Now we have a group of virtual machines running the same hardware that can be easily resized with the Instance Group Manager. The question now is how do we address these machines? This is where a load balancer comes into play. There are a lot of moving parts in the load balancer. Thankfully they all perform very particular tasks and once you set it up you don’t have to worry about it anymore. To use HTTP load balancing we need to declare our instance groups as backend services. This is a simple label attached to the group. In effect we are telling Compute Engine which groups are related to one another. URL maps define what URL requests to send to what backend service. For example , we can route requests to the url /static to a different backend service than requests to the url /. In this example we have a URL Map that routes requests with the pattern /static and /images to the static Backend Service. Any other requests are routed to the web service. The Target HTTP Proxy is a simple proxy that receives requests and routes them to the URL Maps. The global forwarding rule provides an external IP address that we can use to address our instances. This IP address routes to the target HTTP proxy which ultimately directs our traffic to the proper Backend Service through the URL Map. That completes our guided tour of Compute Engine. Given this foundation you should have a solid base with which to navigate the documentation and explore the API.